The Durango isn't as big as a Chevy Suburban, but it's not compact either. 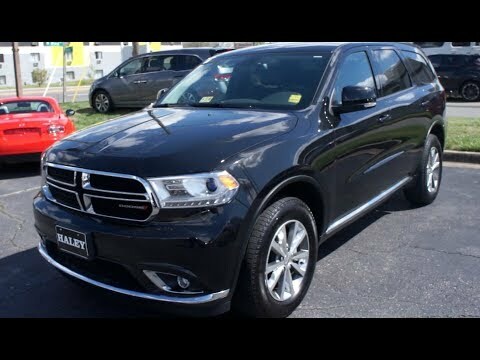 Slightly larger than most midsized entries, the 2015 Dodge Durango satisfies big-family needs in a vehicle that is sleek, modern and manageable. A powerful V8 engine option and tow ratings up to 7,400 pounds bolster the Durango's full-size SUV credentials. 2015 Dodge Durango: decent trunk space for 3rd row SUV. No problems with this vehicle. Very reliable and has a lot of nice features like backup sensors and camera. One feature that I wish it had was removable center seats. They do flip forward, which is nice, but they are not adjustable and cannot be removed. Has a nice sound system and hands free Bluetooth options for cell phones. There are features with texting that do not work with iPhone, but it works well for calls. The navigation is great for having a map handy, and while the directions it provides will get you where you need to be, it is not always the best (fastest) route. There is no latch system in the back row, but it does have the tether hooks. Latch is available in the center row. The windshield does feel a bit narrow horizontally which takes some getting used to. One other thing I wish it had in addition to heated seats is cooled seats - I had that feature in a previous vehicle and it is nice with leather seats. There is no blind spot indicator on the side view mirrors in the model I have. One other thing that I worry will be an issue one day - there are a few things that cannot be adjusted without using the touch screen - if it should ever stop working, I hope it is not a huge deal to replace it. Luxury muscle car in SUV frame. I love my Durango rt. It has comfortable, fully adjustable black leather seats with red trim. It seats 7 with middle captain chairs and a third row bench seat. Both front and middle seats can be cooled or heated along with the steering wheel. The entertainment package is amazing! Radio controls are available on the back of the steering wheel, keeping drivers attention on the road. The Durango has some of the best safety settings I have seen with backup camera with Audio signals, tilted side mirrors, automatic headlights and my favorite automatic windshield wipers! And there’s so much more and options to turn settings off. Keyless entry with key fob and automatic engine shut off if key fob is not in proximity of vehicle. The Durango rat is a luxurious muscle car in a SUVs body. All the luxury and comfort options are nothing without the v8 hemi engine that is the trademark of Dodge. Although, it is not advertised or noted often, pop open the hood and there sits the heart of the Durango. The power behind the v8 hemi is unmatchable! I'll never buy another brand. This truck has got loads of power even for a truck. This is the 3rd version of the Dodge Durango I have owned and I absolutely love it. Its extremely comfortable and packed with lots of features such as bluray player with headrest monitors, 3 row seats to sit 7 people comfortably, dual and rear temperature settings, and paddle shifters . It's been extremely reliable and because this is the RT model it definitely has power. So far I have not had any major issues. If I were to do anything different I would get the model that includes Blind spot and collision avoidance. Overall I love the vehicle and I get plenty on compliments on it. If the rear lower control arm fractures it may result in a change in ride height, loss of rear end stability, and reduced braking capabilities, increasing the risk of a crash. Chrysler will notify owners, and dealers will inspect and if necessary replace the lower control arms, free of charge. The recall began July 29, 2015. Owners may contact Chrysler customer service at 1-800-853-1403. Chrysler's number for this recall is R38. Note: This supersedes Recall No. 15V-407.